Georgie Parker has been given a new lease of life after her op. Source: Getty. She’s been suffering excruciating pain for the past decade, but Aussie actress Georgie Parker has finally transformed her life after undergoing major surgery. The 53-year-old actress, who reached huge fame in Australia with roles including Lucy Gardiner in A Country Practice, Terri Sullivan in All Saints and Ruth ‘Roo’ Stewart in Home and Away, underwent a hip replacement in February this year after suffering osteoarthritis for more than a decade. Now, speaking in an exclusive chat with Women’s Weekly, the star has revealed how the complex operation has finally rid her of pain – and given her back full movement of her body. Georgie admitted that she has always been active and fidgety throughout her life, making the pain she felt before her operation even harder to deal with as she was forced to minimise her movements. She previously revealed the operation had been successful earlier this year and appearing on The Morning Show with Larry Emdur and Kylie Gillies at the time, the seven-time Logie winner opened up about the surgery that forced her to take nine weeks off from filming Home and Away. 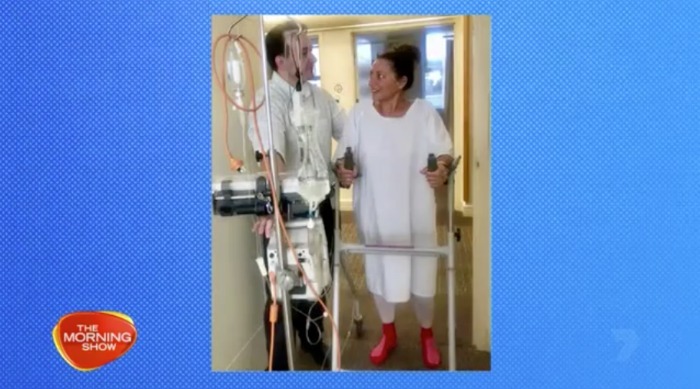 She explained she hadn’t been able to cross her legs for 12 years, calling it a “miracle” that she was finally able to do so again. Gillies told the former All Saints star she thought hip replacements were usually associated with people older than those in their 50s, and questioned the impact it had on her. The actress was diagnosed with the spinal condition scoliosis at the age of just 13 – ending her love of dancing and sport at a young age. She had to wear a Boston Brace made of fibreglass which completely covered her torso for three years. Have you or someone close to you undergone a hip replacement? Did it help you?